When I was on vacation last week, it quickly got out that I'm an amateur palm reader. Before I knew it, I had masses of people offering to buy me a drink if I read into why there was a fork at the end of their heart line. It's situations like this that result in my sister labeling me as a weirdo. Maybe I am. I equate normalcy with dullness. I don't strive to be common or boring. So, I'll take weirdo as a term of endearment. Ever since I was little, I've been fascinated by the occult. I remember when fourth grade recess was held indoors because of the weather. I'd bring my palmistry books or rock collection into school. 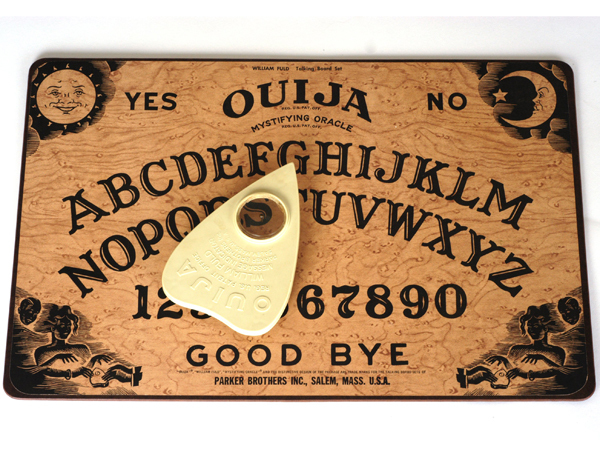 I'd invite my friends to my house for weekend sleepovers complete with seances with Ouija boards and games of light as a feather stiff as a board. I would open the yellow pages (this is pre-internet) and call the psychic hotlines when I was still playing with Barbie dolls. My Mom didn't appreciate when the phone bills came. I've always been open-minded and interested in the universe as a whole. I believe in life after life and feel there are many ways to connect spiritually; whether we're in touch with those who are here or departed. I wish more adults didn't lose their acceptance of the unknown. Children are so much more receptive to the possibilities. While I certainly don't claim to be a highly skilled expert on palmistry, tarot, astrology, Ouija boards or any of the other "weird" things I'm into, I really appreciated seeing adults react in a similar manner as the kids did when I was on the playground. Maybe it was because it was October and Halloween is in the air or perhaps because we were away from home and the drinks were flowing, but I enjoyed every minute of it.